Structured processes for issue reporting and case management. Integrated information and technology architecture for issue reporting and case management. Strategic/operational case planning and administration. This involves the ongoing planning and administration of issues, cases, investigators, workload, and tasks. Core to this is resource and case planning and administration, the ability to measure cycles/seasonality of cases, backlog, resource planning, and costs. Issue intake & triage. This is the foundational component where issues are reported. It involves being able to report and process issues coming from hotlines, web forms, management reports, and other inputs. The goal is to eliminate noise, consolidate duplicated issue reports, flesh out non-cases, and focus on what is critical and exposes the organization to the greatest risk. It is critical that the organization has the ability to automate and link between issues being reported, cases, parties, processes, places, and other relationships. From here initial planning and assignment of cases is done. Investigation. This is the heart of the process that takes reported issue(s) and manages the process of investigation through to closure. Investigators need structured templates and processes to keep everything organized, document the investigation, manage tasks, provide notifications and escalation, and keep all information in one place for ease of reporting. The more the organization can automatically define the process to investigate an issue/case, the better. Accountability, centralization of information, keeping everything current and up to date, and having a defensible system of record that can stand up in court is critical to this stage of the process. Remediation & resolution. History repeats itself because no one was listening the first time. 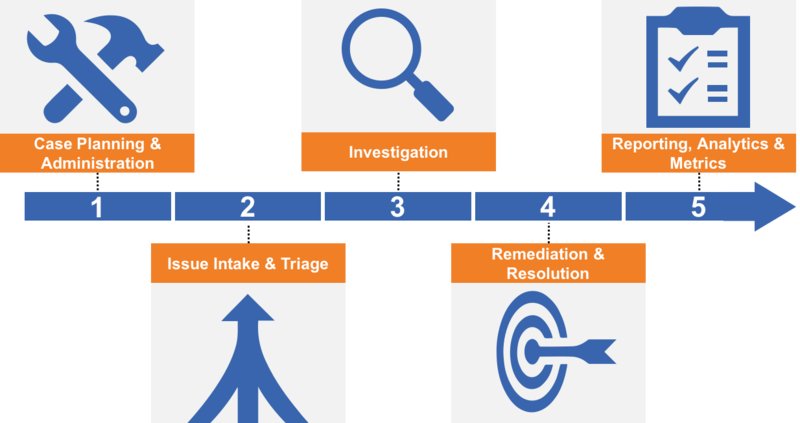 This stage of the issue reporting and case management process ensures that remediation steps are followed to mitigate or eliminate the risk of further issues and incidents. The organization needs to be able to track action items and ensure that things do not slip through cracks to obtain a reduction in repeated and future cases. The organization requires the ability to link issues to policies and procedures to ensure they are updated as resolutions dictate. Reporting, analytics & metrics. This is the stage of the process that provides detailed reports on both individual and aggregate cases. The organization should be able to track past due tasks, benchmark timelines of cases, identify where loss can be mitigated, and reduce gaps.